We look at the various packages they have available and what each one offers, to help you decide which is the right one for you. One of the most difficult aspects of running your own business is taking care of the financial side of it. Whether you are a small business struggling to keep on top of tasks such as issuing/chasing invoices and recording expenses, or you are a larger business trying to get to grips with more complex tasks like taking care of your payroll, if you don’t stay organised then things can quickly get out of control. This is where online accounting programs like Sage Business Cloud Accounting* and Sage 50cloud Accounts* can be a real lifesaver. Sage’s cloud accounting solutions can help you to take care of your business finances with the least amount of effort. So, what do these two online accounts packages from Sage offer and which one is right for you and your business? Let’s take a look at them to find out. Aimed at small to medium sized businesses, Sage’s Business Cloud Accounting software offers two different pricing options depending on what kind of features you require. The cheaper of the two options is the Accounting Start plan. Accounting Start costs just £10 per month + VAT, but for a limited time you can get 40% off the first 3 months if you sign up here*. Alternatively, you can get a 30 day free trial* if you’d prefer to try before you buy. The Accounting Start plan give you the chance to get started with Sage cheaply if you only require basic features. Features offered on the accounting start plan include the ability to create and send invoices to clients, the option to link your bank account to easily match transactions and access to Sage’s online app so you can take care of things on the go. If you run a slightly more complex business and require more features, then you may find that Sage’s standard Business Cloud Accounting plan suits your needs better. The Standard Sage Cloud Accounting plan normally costs £22 per month + Vat but you can currently get 70% off for the first 3 months when you sign up here*. 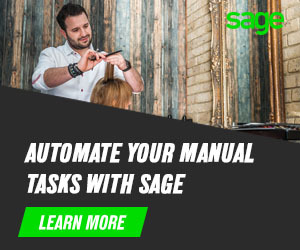 The Sage Accounting plan gives you many more features than the Accounting Start plan including the ability to create quotes and estimates, look after VAT and you can even manage more than one company. Formerly known as Sage 50 Accounts, Sage 50cloud Accounts* is used by over 400,000 businesses. Sage 50cloud Accounts packages start from just £20 per month + VAT but go all the way up to £125 per month. You can also trial Sage 50cloud Accounts free for 30 days* to help you decide if it is right for you. The great thing about Sage 50cloud Accounts is the ability to start off with a basic package but scale up as your business grows. This could save you a lot of time and hassle in the future, especially if you find yourself having to switch online accounting provider because you discover your current provider can’t grow along with your business. Some of the best features of Sage 50cloud Accounts are the ability to manage and control stock and inventory. There is also a very sophisticated VAT management feature and the ability to add bespoke features that will be of benefit to your business. When buying anything in life it is good not to just take one person’s word for it. So, what do other Sage Cloud Accounting customers have to say about their experience with the company? On this note, it’s good to see that Sage have a 4 star rating on the UK review site Trustpilot based on almost 1000 reviews, with 77% rating their service as excellent. If there is one name that most business owners would associate with accounting software it is Sage. They have been a market leader in integrated accounting and payroll for decades and are a trusted name. Whether you are a small startup taking on accounting for the first time or a large organisation looking for bespoke features, Sage have an online accounting package to suit your needs at a reasonable price. So why not start a 30 day free trial with Sage* today to see how you enjoy using the software. Is the Internet the Biggest Asset for Companies? Xero Review – Is it the right online accounting software for you?